Celebrated Hollyrock bad boys Mötley Crüe open their so-called final coast-to-coast farewell blast tonight with Alice Cooper, triggering yet another round of top trending ticket sales across the country, said Marta Ault at BuyAnySeat.com. The hard-living Los Angeles heavy metal hair band is set to hit 67 cities in 38 states starting with Milwaukee, Noblesville, Cincinnati, Columbus, Maryland Heights, Des Moines, Wichita, Tulsa, Cedar Park and Dallas after kicking off at the Van Andel in Grand Rapids, Michigan tonight, July 2, 2014. Hard-living heavy metal hair band Mötley Crüe, with Alice Cooper, will hit 69 cities in 38 states this summer and fall on their Final Tour after blasting off in Grand Rapids tonight, July 2, 2014. Alas, but all good things must come to an end. After more than 30 years of heavy metal, with a heavy dose of hard living on the side, the celebrated bad boys of Mötley Crüe say they’ve had enough. In the meantime, legions of fans, fearing potential withdrawal symptoms, have gone on a massive ticket-buying binge to witness their farewell blast with renowned rocker Alice Cooper, aka the Godfather of Shock Rock. The glam metal group’s last hurrah, dubbed The Final Tour, looks to be a massive blow out. The current schedule, grueling for a rocker of any age, hits 67 cities in 38 states throughout the summer and fall after opening at the Van Andel Arena in Grand Rapids, Michigan on July 2nd. The current wrap is set for the Spokane Arena in Spokane, Washington on November 22, 2014. 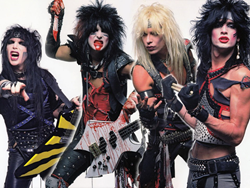 During a much-hyped press conference, singer Vince Neil, guitarist Mick Mars, drummer Tommy Lee and bassist Nikki Sixx each signed a “cessation of touring agreement.” They sat next to tombstones bearing their names, had a lawyer present, and cameras rolled. “With their final tour opening tonight, Mötley Crüe has been one of the top discount concert ticket sellers nationally over the last week,” said Marta Ault at online discount ticket marketplace BuyAnySeat.com. “That’s why we’re proud to offer fans a complete and continuously refreshed inventory of discount concert tickets, with a Worry-Free Guarantee to protect their purchase,” added Ault. The group was formed in Los Angeles, California in 1981 by bass guitarist Nikki Sixx and drummer Tommy Lee, who were later joined by lead guitarist Mick Mars and lead singer Vince Neil. Over they years, they have become known as the world's most notorious rock band and one of the world's best-selling groups of all time. The band members have also been noted for their hard-living, hedonistic lifestyles and the bad boy personas they pursued. All have had numerous brushes with the law, spent time in prison, suffered from alcoholism and long addictions to drugs such as cocaine and heroin, had countless high-profile escapades with women and are heavily tattooed. During their careers, they have also amassed worldwide album sales exceeding 80 million, garnered seven Platinum or multi-Platinum albums, 22 Top 40 mainstream rock hits, six Top 20 pop singles, three Grammy nominations, four New York Times bestsellers and countless sold out tours around the world. Their ninth and most recent studio album, Saints of Los Angeles, was released in June of 2008 and was certified Gold in January 2012. The band’s opener, Alice Cooper, has attained widespread commercial success as well. Known for his stage shows featuring guillotines, electric chairs, fake blood, boa constrictors and baby dolls, Cooper has drawn equally from horror movies, vaudeville, and garage rock to pioneer a grandly theatrical and macabre brand of rock designed to shock. His work consists of 26 studio albums, 46 singles, 10 live albums, 21 compilation albums, 12 video releases, and an audiobook. Six of his studio albums have achieved platinum status in the United States, while two have achieved gold status. Cooper has also been nominated for two Grammy Awards since his first official release, Pretties for You, in 1969. His latest studio release was 2011’s Welcome 2 My Nightmare. Cooper was inducted into The Rock and Roll Hall of Fame in 2011 as well. The tour will also serve to promote an upcoming country-music album paying tribute to the band, due for release in summer 2014, and their movie "The Dirt", due for release in 2015. The door is ajar for new Motley music, too. Lee recently told Billboard that the band just recorded a new track, "All Bad Things Must End," which is expected to be released in conjunction with the tour. He also promised an "insane" production for the upcoming dates, and a set list comprised of many hits and a few deep cuts. After kicking off in Grand Rapids, Michigan, the tour will perform in Milwaukee, WI; Noblesville, IN; Cincinnati, OH; Columbus, OH; Maryland Heights, MO; Des Moines, IA; Wichita, KS; Tulsa, OK; Cedar Park and Dallas, TX; Albuquerque, NM; Phoenix, AZ; Los Angeles, Irvine and Mountain View, CA; View, CA; Reno, NV; Ridgefield and Auburn, WA; and Wheatland and Chula Vista, CA to close out July. To shop for discount Mötley Crüe tickets, visit BuyAnySeat.com. To save even more, enter coupon code "BAS2014" at check-out.